Another 51 wins & 148 nominations. When I am communicating with other people interested in crime series it is remarkable how many people seem to watch either CSI or CSI: Miami or both. Rarely (actually never) have I heard talk about this show, unless I brought it up myself and ended up discussing it with them. Of course I do not know the situation in America and other countries regarding this show, but I feel it is very underrated in the Netherlands. Of course this has a lot to do with it's programming spot. While CSI is usually on Saturday's at 8:30 or 9:30 p.m. and CSI: Miami on Tuesdays at 8:30 p.m., SVU's spot has been Sunday's around 11p.m. for quite some time now. That's hardly what I call a prime time spot. Just to compare I looked up the share's of those 3 shows on the internet. CSI has a share of 26 in the US and 17,5 in the Netherlands. For CSI:Miami these numbers are 15,0 and 13,2 and for SVU they are 17,0 and 7,7. This doesn't mean much, but once bring the number of households into it, it gets a lot clearer. CSI has about 18,6 million viewers in the US while CSI:Miami and SVU have 10,5 and 11,9 viewers respectively. In the Netherlands these figures are 1,175 million; 910 thousand and 370 thousand. This means that SVU has less than one-third of the viewers CSI has and MUCH less than half the viewers CSI: Miami has. In America SVU has two-thirds of the viewers of CSI and about 10% more than CSI:Miami. In my opinion this has a lot to do with the extremely bad programming spot SVU has gained in the Netherlands and the fact that the program is not advertised as vigorously as the two CSI's, for I feel it cannot have anything to do with it's quality. The thing that makes SVU stand out so much in opinion, is that the stories depicted are very realistic and heart felt. I personally appreciate it very much, that there are no cheap attempts to make you cry by extending dramatic scenes or underscoring them with sad music. Mostly the sad parts happen quite suddenly and are relatively short. Maybe that's just another 'trick' to get you to cry without being as obvious as many soap opera's. TO me though, it makes the stories appeal much more life-like and truly gut-wrenching and sad. Also all of the characters are good. If you watch long enough, you can get bits and pieces of information on everyone of them, thus discovering what makes them tick. I must admit that the series has changes it's emphasis a bit in recent years. In the first year there were numerous episode's that featured theme's or events from the investigator's home environment (especially Stabler's). This trend has somewhat diminished over the years, yet you can still see each individual's background shining through into their work ethics. One thin I really had to get used to was Richard Belzer's (Det. John Munch) role getting smaller. It seems to me that in the first few years of the series he was present much more and he made much more cynical remarks, something I really enjoyed. But overall the series has not changed for the worse, for I feel it has actually improved. While a few years ago I'd given this series an 8 out of 10 I'm much more inclined now to rate it even higher. What I've come to appreciate these last 2 or three years, were the additions of Ice-T (Det. Fin Tutuola), B.D. Wong (Dr. George Huang) and Stephanie March (A.D.A. Alex Cabbot) to the team. Stephanie March's character provides the viewer not only with an insight to what the D.A's job is, but her involvement in the series also shows what difficult decisions need to be made at times when the victim becomes the pursued or when a suspect cannot legally be brought to justice. Huang's intense involvement lately is in my opinion the biggest and best evolution the series has undergone (up until now). Not only because there have been few if any series which placed the work of the forensic psychiatrist is in the spotlight, but also it is much more realistic than for instance the media's depiction of profilers in The Silence of the Lambs or the TV-series Profiler. Also I think it is good (in addition to being very interesting) to show the public that not every offender is purely bad, but there is often much more when you go beyond the surface. As for Ice-T's character, I think he really completes the mix in the show, as the tough street cop. Him and Belzer are an ideal couple, just like Benson (Mariska Hargitay) and Stabler (Christopher Meloni). The reasons, I personally feel SVU is the best crime series on the tube at the moment, are easily summarized. It has very much diversity, it offers insight into the psyche's of both victim's and perpetrators and it is realistic in every aspect. 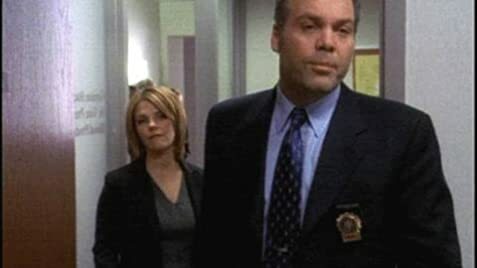 According to executive producer Ted Kotcheff, the lead parts of Detective Olivia Benson and Detective Elliot Stabler came down to three actors and three actresses: Mariska Hargitay, Reiko Aylesworth, and Samantha Mathis for the role of Benson, and Christopher Meloni, Nick Chinlund, and John Slattery for the role of Stabler. Capt. Donald Cragen: You don't get to pick the vic. Cases occasionally involve a murder that the detectives investigate. Though they'd be consulted on any sexual aspect of the crime, SVU wouldn't investigate the murder itself. From the second episode of the second season (2000-2001), the opening credits break the pattern followed by the earlier episodes of SVU, the original Law & Order, and Criminal Intent. Instead of the credits ending with a shot of the cast walking towards the camera, they instead are shown sitting around a desk.